Voting has already begun in the federal Conservative leadership election that will conclude on May 27. Paid-up party members will vote in their constituencies, which will each have an equal number of votes, regardless of how many votes are cast in each constituency. It is a preferential ballot among up to 13 candidates (14, if we count Kevin O'Leary, who quit the race after the ballots were issued), so as candidates are eliminated, votes are redistributed in ways that are impossible to predict. I have met with most of the candidates and they seemed to me a stronger field than the last Conservative race, in which Stephen Harper defeated Belinda Stronach (a friend and a great star but a bit stretched in policy terms). It is a much stronger group than recent Liberal leadership selections. As I have written here before, I do not believe a Conservative leader can be elected prime minister without speaking French passably. There are three million unilingual French Quebeckers, and approximately eight million reasonably bilingual (French and English) Canadians, mainly with French as their first language, to whom bilingualism is important. A unilingual Conservative leader will trail the Liberals by 40 or more MPs in Quebec, and will forfeit at least another 20 MPs elsewhere in largely bicultural districts, where the traditional Liberal claim that only they can keep the country working will be widely accepted. Canada did well with a 1.5-party system from 1896 to 1984, in which the Liberals governed for 66 out of 88 years, and carried Quebec in 24 elections out of 25. Laurier, King, St. Laurent, Pearson, Trudeau, and Turner were all capable prime ministers, but where usually only one party can win, it is a fundamentally unstable system. The application of the bilingualism criterion, as O'Leary eventually came to accept, reduces the field to a handful of the contestants. In all of the circumstances, and as the polls indicate is likely (for what they are worth when so detached from national opinion), Maxime Bernier is the logical choice. Bernier's English could be improved, and doubtless will be, but he is not acoustically irritating and could, with practice, sound almost like Charles Boyer or Charles Aznavour. The Liberals will presumably retain their strength in and around Montreal Island, and the Upper Town in Quebec City. Bernier could challenge strongly in the rest of the province, from the Eastern Townships to the Gaspe on the South Shore of the St. Lawrence, and from Manicouagan west to Lake St. Jean, Abitibi and Temiscamingue in the north. Fighting two Quebec leaders, the post-Mulcair NDP should flop back to their traditional insignificance in Quebec, and the separatist Bloc Québécois, always an absurdity in a federal election, should wither completely. The Bernier argument only begins with language demographics. He is an original and thoughtful conservative of libertarian tendencies who does not believe that Canada defines its identity by having more government than the United States. He wants to end CRTC control of the telecom industry, shut down the marketing boards that rig an artificially high price for dairy and poultry products, privatize the country's airports and the post offices (measures that have worked in Britain), and dispense with carbon and capital gains taxes. In foreign policy, he wants to backtrack on the current deference to the United Nations and tie aid to countries that promote human rights and free enterprise. And he recognizes the need for stronger armed forces to increase the country's influence in the Western Alliance, and the stimulative economic effect of increased high-tech research, domestic armaments procurement, and recruitment and education of personnel. For these reasons, my half of the compact political machine I operate with my friend Duncan Jackman has opted for Bernier. Stephen Harper imposed conservatism by reducing the federal share of the sales tax and gradually collaring public sector spending— a respectable strategy but one that left him with no room to innovate or broaden his electoral base when the Liberals rebounded from their anomalous position as the third party. Bernier's is a program to make Canada an enterprise state and generate higher economic growth. There has never been any excuse why Canada has had a lower per capita income than Australia, and has not had a stronger capital market. This is a plan to attract investment, torque up the economy, and bet on Canada's ability to compete. It is the logical sequel to Brian Mulroney's highly successful Free Trade initiative of 30 years ago. Many always doubt that we can compete, but we can. The Liberals are confident that they can embarrass Bernier, including over his skepticism about climate change, the climate's connection to human activities, and the desirability of a horribly expensive pursuit of renewable energy. The entire Liberal ethos in this area was born in the false, green debacle that has turned mighty Ontario into a deficit-raddled have-not province, including the migration from Toronto to Ottawa of many of the people responsible for the McGuinty-Wynne negative economic miracle. The government has no cause for electoral complacency. The only significant initiative it has taken in 18 months is the legalization of marijuana, and that has been an attempt at a political free lunch by pitching to the pot lobby while sending Ralph Goodale and Bill Blair out on a Toews-Fantino memorial tour on how any excesses would be suppressed with redoubled zeal. Especially on this subject, it is implausible to inhale and exhale at the same time. (I am for legalizing all drugs, with compulsory treatment of hard drug addicts, because the war on drugs has been a crushing defeat for society, and government — rather than the criminal community — should have the revenue from it.) The government has failed to require reasonable accountability from First Nations leaders, and now wishes strikes in the public service to be called without a vote, by union leaders whose predecessors this prime minister's father incarcerated for doing what he is about to legalize. Fiscal performance has been mildly irresponsible, without stimulating enhanced growth. And the defence minister's lies are excused as mere mistakes. It has been far from a disastrous performance, but it hasn't challenged any records for good government either. And contrary to well laid Liberal plans, Canadians will not sit down under a 53 per cent top personal income tax rate in most of the country, especially when it is 35 per cent in the U.S.
Bernier's intelligence is frequently questioned, but so was Justin Trudeau's, and they are both certainly sufficiently intelligent to lead a government, and likable men personally. In a campaign between them, the Liberals would over rely on their perennial charge that the Conservatives are "harsh" (the rap on John Crosbie's excellent budget in 1979), minions of the rich, reactionary, and out of step with the traditional campy Liberal-NDP, feel-good, do-right, soft-left re-election formula: massage money from those who have earned it to those who haven't, in exchange for their votes in the holy Canadian name of fairness. Bernier will be hard to represent as an ideological skinhead, and his ideas, which he has considered for all of the 12 years I have known him and before, could provide a very refreshing contrast to the usual, tired, Liberal porridge. The tumult and misgovernment in the United States in the last 20 years has made Canadians more confident, and they might just be ready for something original — a rare phenomenon in Canada. Mackenzie King (and R.B. Bennett) imitated Franklin D. Roosevelt; Louis St. Laurent was Dwight D. Eisenhower without a uniform or a golf cap. Lester Pearson was JFK's imitative uncle, and Pierre Trudeau was a Western European social democrat — Willy Brandt and, eventually, François Mitterrand. Brian Mulroney broke new ground as a free trader and promoter of sales taxes, Jean Chrétien trod water but eliminated the deficit, and Stephen Harper had bits of Thatcher and Reagan, except diluted in the emollient Canadian manner. Two years ago, I believed Justin Trudeau deserved a chance, as Harper's generally good government had become an inert and desiccated personal despotism insulting the voters with nonsense about female Muslim headgear and a phony trans-oceanic immigration scare. Trudeau hasn't done badly and may do better, and Bernier will revive the opposition and make an interesting contest, for the first time federally, between two French Quebec anti-separatist party leaders. 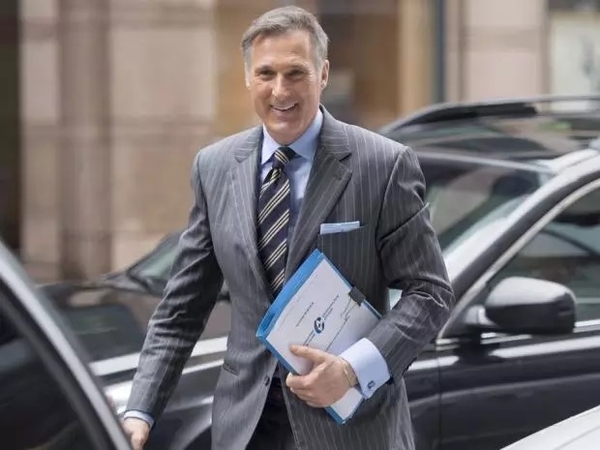 Maxime Bernier will have plenty of material to make a shadow cabinet, including capable ex-ministers like Chris Alexander and very able newcomers such as Rick Peterson. It could be a lively but civil campaign, effervescent in policy terms, and it is some time since we have had that.